NaazukSpace: The WeekEND that never came to an end! The WeekEND that never came to an end! 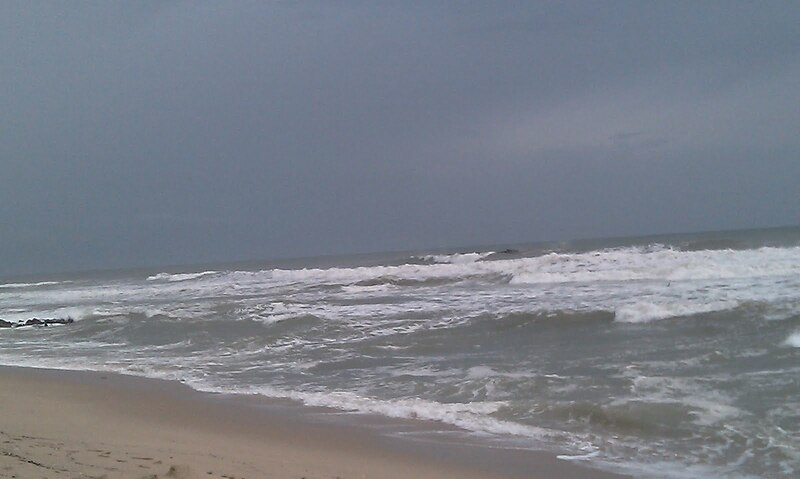 Mangalore is beautiful. I do not say this because i belong here, its the fact. Its a city which has made my life so damn beautiful. Being born and brought up in Mangalore, it is obvious that everything revolving my life has happened here or it was linked to Mangalore in some way or the other. And I am glad about it. I love almost everything about Mangalore (Of course, there are exceptions whenever we say we we love something) :p The people, the places, the streets, the restaurants, the schools/ colleges, the malls, THE BEACH! Take a survey about Mangaloreans and ask them 'When did u visit 'Panambur or Tannirbavi' last?' 90.. umm.. 95% would answer ' Last sunday'! That's the kind of human traffic these two beaches attract every weekend. It was a Sunday and as usual, all roads were leading to the Beach. We were among them too. 'We' were a group of 5. A crazy group of 5, to be precise. A black Scorpio, Elder bro steering our ship, oops.. our Scorpio, Cousin bro clicking pics and we three girls laughing on our cousin bro's jokes. (Yeah u imagined it right, the typical 'hehehehe' laugh) LOL! We zoomed our way through the city traffic and reached the outskirts leading to the beach. We go to the beach every weekend, yet enjoy every single time and this time we were sure it would be an awesome trip, because of the magic our '5' member gang would create when we would get together. And this time 'We' were hanging out together after years. We reached the beach. 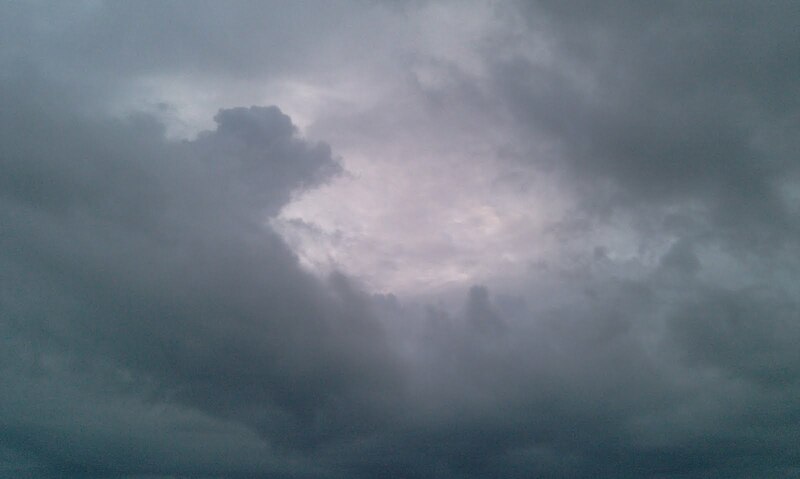 The dark clouds reached too. And yes, it started drizzling. Our excitement levels rose higher. 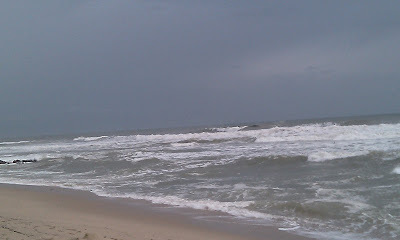 We were elated to be at the beach amidst the rains. We enjoyed every bit there. 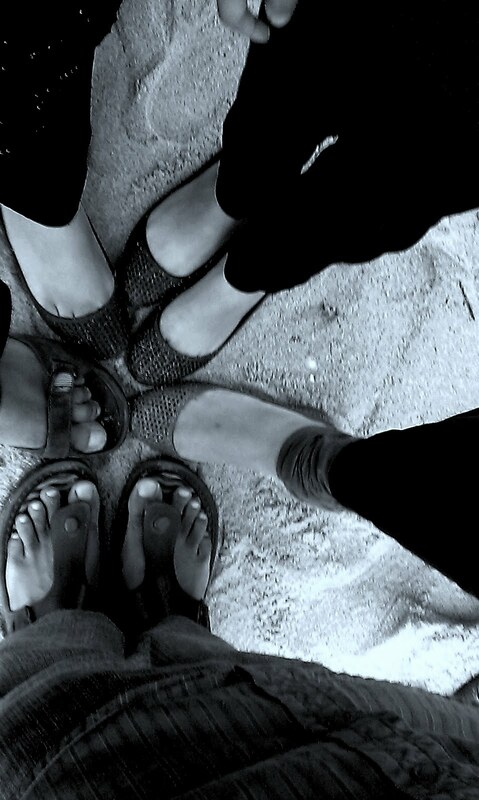 Spoke, laughed, clicked pics, teased each other and carved memorable moments together. And then it poured. We stayed on for some time enjoying the rain and then, we were back in the car. Cousin bro asked ' Where to next?'. We all screamed for ice cream! :D The wish was granted. 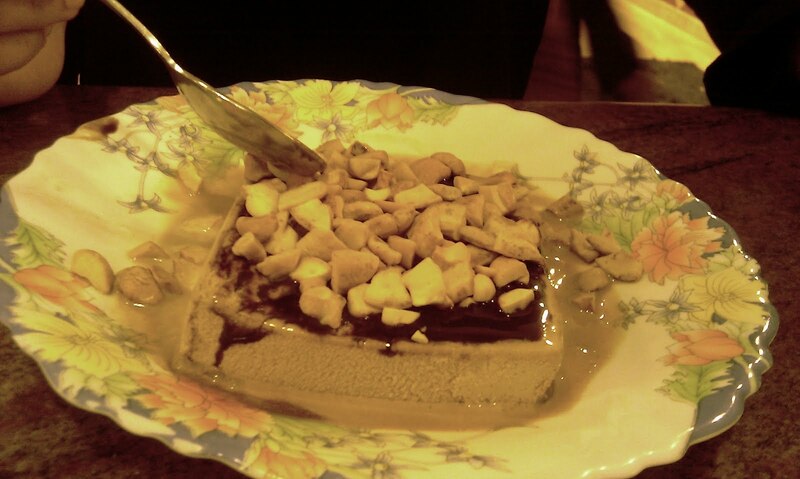 We stopped at 'Pabbas', the yummmmmmmmmiest ice cream serving parlour! But then, there were many more people who had the same wish fulfilled! LOL! It was insanely crowded. We just parked the car and kept watching at the ice cream joint. People looked as if they haven't eaten ice creams for decades! We included. Having contacts in ice cream parlors helps! LOL! We were in after ten minutes. The order was ready in our minds at the beach itself. The waiter came and we told him the names of our favorite ice creams. I said ' Parfait'! :D The chocolate gals ' farmaaished'! The boys- 'Gadbad'! And soon we were lost.. lost in the world of rains, ice creams, instrumental music and air conditioners. And we did.This time in the afternoon on the pretext of picking up my younger sis from school! :p We picked her up from school, picked up few stuffs from the supermarket and waited for cousin sis's classes to get over. We kept calling her up to check if she was done with classes but the girl never picked the call! 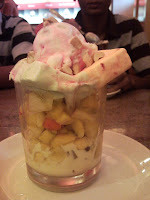 You should never make an 'ice cream crazy' person wait, That's what my cousin sis learnt that day! LOL! By the time she FINALLY checked her cell, she had reached home! And here we were waiting to take her along for the ice cream trip! 'Your loss', We said in consensus. She pleaded guilty like she had been accused for some major crime! LOL! And in few minutes we were back home, only to pick her up to go and gobble up the ice cream! But it was not that easy. Ammi dearest called up and gave me an earful because her darling younger daughter was supposedly ' tired' after her day of school and i had 'zabardasti' taken her on the ice cream eating session. Little did she knew how much this girl had bribed me emotionally to take her along. :p Like always, i was successful in 'maskafying' my mum and before she knew, her little girl had gone upstairs, changed her dress and was back in the car! LOL! 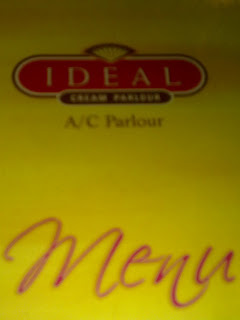 This time we were in Ideals Ice cream parlor. Heaven. Slight changes in our order but the Chocolate girls dint even want to think of a replacement. This time we had ice creams in the second round! So what was the order in the first round, u ask? Hehe..Chatni cheese sandwich! 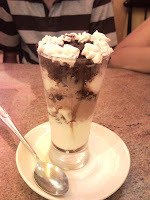 :D Yummmmmmmmmmmmmmmmm!!! After that came the Ice creams. SLURRRRRRRRRRRRRPPPPP! We were having a real good time and someone joked that we would come tomorrow too, to which my sis replied ' Crazy or what??'!. But.. Luck! Luck! Luck! Wednesday came and we were again spotted taking rounds of the school and college waiting for the two girls to get out of their classes. Yea Get out!! LOL! Once they both hopped in, we all burst out laughing! I am sure you all can imagine the scene. ;) Ideals Ice Cream Parlor was the venue again. The order transformed. I was with a ' Lychee with ice cream' request, the bro's with 'Dil khush' and the girls, Nah, they did not change, they exchanged! So yet again they ended up with their FAV flavoured ice cream. Now this time we were DAMN SURE that our ice cream spree would come to a complete halt. Until.. Tring tring... A Cousin sis called up and invited the five of us to her place for dinner on Thursday!! God really loves us. Masha'Allah! :D We laughed real hard and waved at each other with an evil ' See You tomorrow Insha'Allah' grin. Who would not?!? ;) Thursday came and the crazy gang was back with many additions to it. Awesome dinner and desserts! Dil really khush! LOL! Finally it was Friday and our gang member cousin bro was leaving to Dubai, so we now knew for sure that our trips came to an end. Sad! Friday. Cousin bro's flight was at 6.30 P.M and he came to meet us before he left. Yeah you are right. LOL! We went to Ideals again!!!!! This was the craziest ice cream trip because we had no time and were in a hurry but yet we added up to the ice creams parlor's revenue for the day! And it was my treat! ;) We laughed recalling the days from Sunday to the present day and each one expressed how much fun, joy, happiness it brought to them. We were surely a happy lot that week.